Golf carts and Low Speed Vehicles (LSV), also called Neighborhood Electric Vehicles, must follow the same traffic laws as cars, including regulatory signs and the use of directional or hand signals when making turns. The operator of these vehicles can be issued a traffic citation just like you would when operating your automobile; these citations carry fines and points on your license. A golf cart is defined as a motor vehicle that is designed for operation on a golf course or for sporting or recreation and is not capable of exceeding 20 mph. While the operator of a golf cart does not have to be a licensed driver, the driver must be over 14 years or age. Many Villagers ask if they can modify their golf carts to exceed 20 mph and the answer is they cannot legally and there have been tickets issued to those who have been caught exceeding 20 mph. An LSV is defined as a four-wheel electric vehicle whose top speed is greater than 20 mph, but less than 25 mph. LSV may operate on the streets where the posted speed limit is 35 mph or less. LSV can also cross roads that have a speed limit greater than 35 mph. The operator of an LSV must be a licensed driver. LSV must have a registered license plate and be insured. The LSV must be equipped with at least the following safety equipment: Seat belts, a windshield, rear view mirror, horn, headlights, tail lights, stop lamps, side reflectors, a parking brake, turn signals and a VIN number. To operate at night or before sunrise your golf cart must be equipped with head lights, brake lights, turn signals, and reflective warning devices on the front and rear sides of the vehicle. Headlights should be used 30 minutes before sunset and 30 minutes after sunrise; headlights should always be used during inclement weather. Golf carts may not cross over or drive on highway 27/441, CR466, CR466A, Griffin Ave or any other road with a posted speed limit sign of 35 mph or higher. An LSV can be operated on a road whose speed limit is 35 mph or less. A golf cart can be operated on a state road that has been designated and marked for golf cart use. Golf carts must use the transportation multi-modal trails adjacent to El Camino Real, Buena Vista Boulevard, Morse Boulevard and CR466 & CR466A. These roadways can only be crossed in a golf cart by using the marked tunnels. The only exceptions are that golf carts can cross El Camino Real at the traffic light between Enrique Drive and Botello Ave. In addition, while golf carts are not permitted to travel on Rainey Trail. (CR472) they are permitted to cross between Lynnhaven and Miona Shores Drive. LSVs are permitted to travel on Rainey Trail since the speed limit is only 35 mph. On streets within The Villages, with a posted speed limit of 30 mph or less, golf carts should be driven in the marked diamond lanes or along the right-hand edge of the street if there is no marked lane. Do not allow anyone to ride standing in the vehicle or on the back platform of the vehicle. Please keep your arms and legs inside the vehicle at all times for the safety of you and your passengers. When making a left turn, after signaling your intentions, carefully merge with vehicular traffic just prior to the intersection and turn using the proper signal and turn lane where available. Anywhere signage or road markings provide such direction; golf cart traffic should always merge with vehicular traffic. Golf carts should always yield to other vehicular traffic in all cases. Golf carts and LSV’s are not permitted to travel on sidewalks. 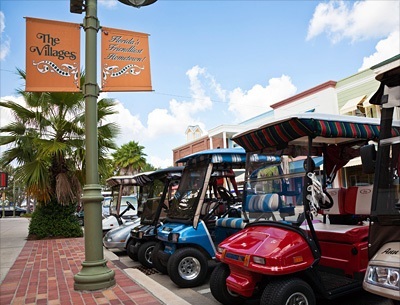 These guidelines are provided by The Villages Homeowners’ Association (VHA) for information purposes only and to help you enjoy using a golf cart and to help keep you and your love ones safe. Please remember that your golf cart was not designed to share a roadway with larger vehicles such as cars or trucks. In the event of a collision you have about as much protection as if you were riding a motorcycle. The insurance industry considers a golf cart an ATV (All Terrain Vehicle). For more information you should contact your local sheriff’s department. For additional information on golf cart safety, watch this video or please plan to attend one of the Golf Cart Safety Clinics presented by The Villages Homeowners’ Association.